Any could any Christian call this atrocity of a movie Noah Biblically accurate, endorses it, praise it, encourage people to go see it – have forgotten or not read the Bible. The movie Noah is an environmentalist extremist movie changing (perverting) God’s word, removing the God of the Bible (only refers to a creator), promotes the Nephilim (Angel mating with women myth) along with a ‘boatload’ of fantasy. 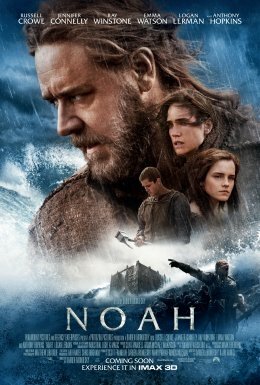 If that is not enough, its writer-director turns the great man of faith Noah (as seen in the Bible) into some sort of weird environmental wacko. Any Christian leader like the one I previously pointed out – Brian Houston – should be booted out the door – they are unqualified to be leaders of a Bible believing Gospel preaching church that is! I believe some of these ‘leaders’ like their political counterparts RINOs (Republicans in Name Only) are CINOs (Christians in Name Only) akin to wolves in sheep’s clothing! I use the political comparison because this is what I see these wolves doing, they are working with, partnering with, yoking together with Hollywood – working with those who are the most notorious in maligning and slandering our holy God! How can we get into bed with them reviewing their movies knowing that they are all about the bottom line – unless you make yourselves complicit in their abominations to God!? “The staggering implications to this fraudulent retelling are legion and not within the scope of this brief review. ← In Time Magazine – Senior Pastor Brian Houston Gives “Stamp of Approval” to Noah – Why!? I think it is a very sad misinterpretation of a God of love who had a more intimate relationship with his creation than is depicted. He is certainly not this innocuous blur referred to only as creator.